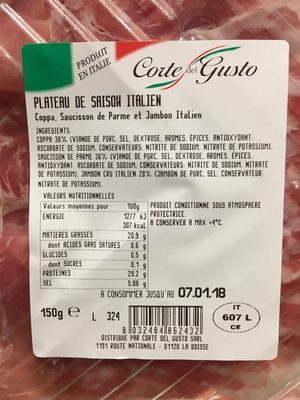 Code OE SRISON Coppa, Saucisson de Parme et Jambon Italien coppa DE PORC, SEL, DEXTROSE, BROMES, ÉPICES, BNTIOXYOBNT: DE CONSERVRTEIJRS: NITRITE DE SODIUM, OE SRUCISSON DE PflRt1E 36% (VIRNOE DE PORC, SEL, DEXTROSE, BROMES, ÉPICES RSCORBRTE OE CONSERVRTEURS: NITRITE DE SODIUM, NITRRTE DE POTRSSIUM), CRU ITRLIEN 2870 (JRMBON OE PORC, SEL, CONSERVRTEUR: NITRRTE DE POTRSSIIJH). 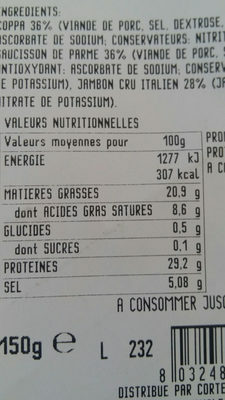 VRLEIJRS NUTRITIONNELLES PRODUIT CONDITIONNE SOUS Valeurs moyennes pour 100g 12i7 kJ PROTECTRICE. ENERGIE R CONSERVER R MBX "oc. Product added on December 3, 2017 at 7:08:55 PM CET by kiliweb. 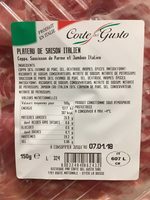 Last edit of product page on September 27, 2018 at 2:18:35 PM CEST by .